A well-known symptom of menopause is depression, often making this life stage an unpleasant transition. The symptoms can mirror those of clinical depression, and in some cases, menopausal depression can lead to development of this psychological condition. It is important to be mindful of the symptoms of depression, as managing it in the initial stages can prevent a more serious condition. Read on for more information about the causes and symptoms of menopausal depression. It is normal to sometimes feel down, depressed, and helpless as a natural emotional response to stressful life events, but when the negative feelings become chronic and affect everyday life, they can turn into depression. A person cannot simply snap out of depression, and they can often feel exhausted by simple daily activities. There are a range of psychological, physical, and social symptoms that accompany the condition, a few of which are mentioned below. Severity differs depending on the person, and there are a number of different types, including menopausal depression. Depression is a condition that is more likely to affect women, although whether this is due to genuine gender differences or more to do with the social stigma attached to male displays of emotion, it is hard to say. It is estimated, however, that around 1 in 10 American adults suffer from depression. 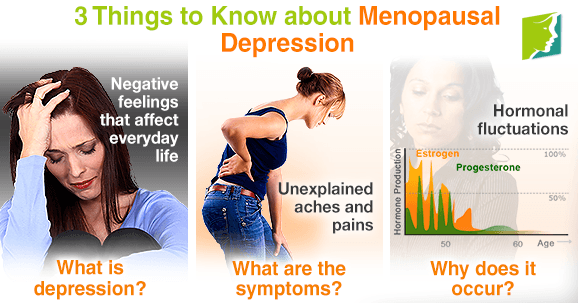 What Are the Symptoms of Menopausal Depression? Why Does Menopausal Depression Occur? Different studies have shown that estrogen regulates the production, release, and activity of the neurotransmitters endorphines and serotonin. As menopause is a time of fluctuating estrogen production that is gradually declining, it is no surprise that many women can feel their mood is disrupted. Other symptoms of menopause (e.g., hot flashes, sleep problems, and vaginal dryness) can be painful, embarrassing, and distressing, which has an understanding effect on overall well-being and can be the source of a low mood. The timing of menopause tends to coincide with other big changes in a woman's life. She might be feeling low because her children have left or are leaving home. Also, the death of a spouse or parent, or even the extra stress of dealing with aging parents or in-laws can contribute to a feeling of depression. Feeling negative and fearful about menopause and getting older can affect a woman's mental well-being. Menopause is traditionally seen as an undesirable time in a woman's life, and there is a pervasive societal attitude of it being “the beginning of the end," which can be harmful to women's psychological health and outlook. Depression can be a result of many factors combined, and it can often be a lonely and isolating experience. However, it does not have to be an inevitable part of menopause. There are many lifestyle changes, supplements, and medical treatments that can help with depression. Any concerns should be discussed with your doctor, who can recommend the best action for you.